I grew up in an Irish Catholic neighborhood on the south west side of Chicago and originally was accepted at Quigley South Seminary. My family moved to Downers Grove and I instead attended Benet Academy. After graduating high school, I attended Drake University on an athletic scholarship. I transferred and then graduated from Illinois Benedictine College in 1976 with a Bachelor of Science degree. Northwestern University Dental School was my next stop and I received my Doctor of Dental Surgery in 1980. When I was a junior in Dental School I married Janet and by the time I graduated we had a baby girl named Kelly. Patrick ll, Sean followed very quickly and we waited 13 years to have our last two daughters Michelle and Heather. 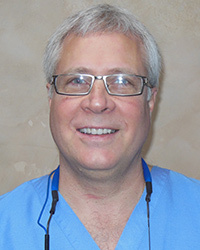 My first job in dentistry was to work as an associate in a Westmont practice. I then started my own practice in February 1986 and have been at 19 North Cass Avenue ever since. We live in the back of the building and work in the front like many of the business did years ago in downtown Westmont. My education did not stop when I graduated from Dental School. I have attended many courses of continuing education including the prestigious Pankey Institute, the Dawson Center for Advanced Dental Studies, Frank Spears courses, Mark Piper’s courses and many other courses in topics I enjoy most. It is fun to be a dentist, owning my own practice because things are constantly changing for the better. Technology has advanced greatly since I graduated. It has been a joy to have been a part of the Advanced Dental Study Club and now with Dr. Timothy Walsh’s study club. Keeping up with the changes in dental technique and materials has been a fascinating journey that will continue as long as I practice, which will be for quite a while since my youngest is just starting high school! Dentistry has truly been a gift from God and I look at every patient as a gift from God to me. I look at my day to day work as a sacred mission. Going on 15 dental mission trips over the years has brought a deeper understanding of life. In many areas, I now have a greater appreciation for what we have. My latest project has been to become a Candidate in the Diaconate Formation Program in the Archdiocese of Joliet. It is a 4 year training program and I am a little more than a year into it. Since Catholic Deacons aren’t paid I will still have my Practice to round out my life for hopefully many years to come.